Jammar’s Traverse Ropes feature galvanized metal thimbles on both ends of any of our premium 1.25″, 1.5″ or 2″ diameter ropes. Metal thimbles eliminates bolts and hardware allowing for safer use in high rope challenge skills. 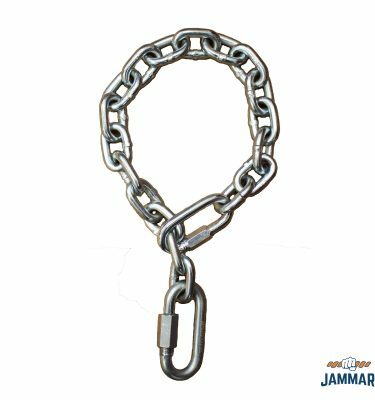 The metal thimble also insulates the rope from abrasion, especially recommended for unusually high rope applications or where additional strength is required. 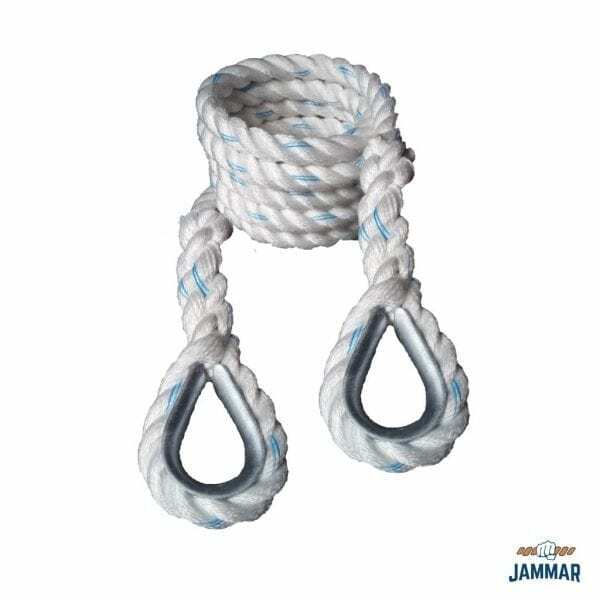 They are fabricated from quality 3-strand twisted manila and polyester blend (poly Dacron) rope. 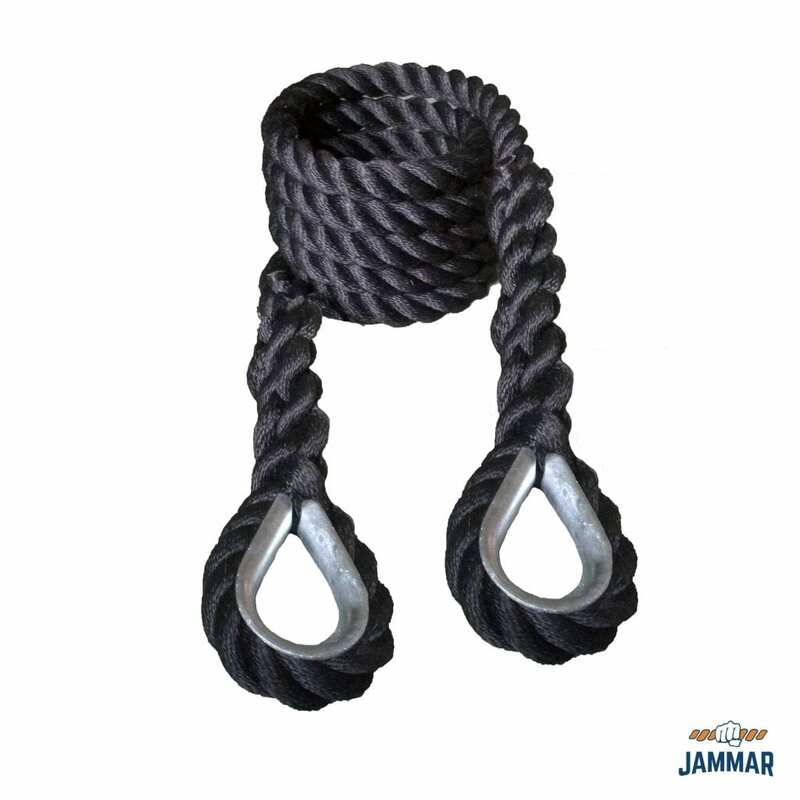 Our selection of poly Dacron rope is chosen for its excellent moisture and UV resistance and is one of the best gripping synthetic ropes and they hold up well to abrasion. Natural Manila Rope: Traditional, superior quality, pure “Grade A” manila rope. Best manila in the industry. 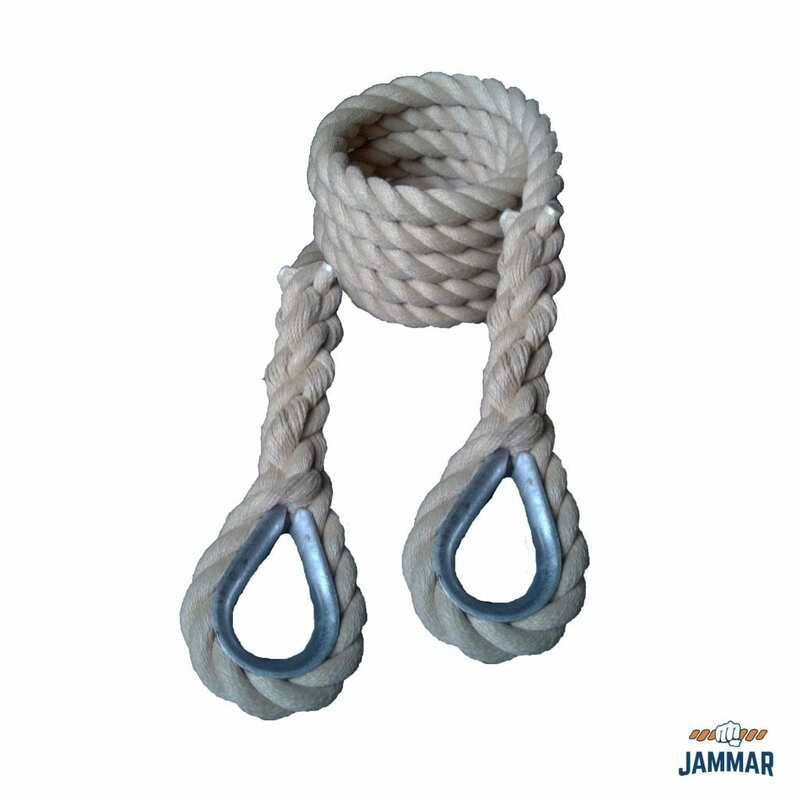 This natural fiber rope absorbs perspiration for the best grip and is extremely durable, very little splinters. Poly Dacron Rope: These ropes introduce an extremely soft rope material as well as having excellent moisture and UV resistance characteristics. Has an extremely strong and lightweight polypropylene core with a soft and durable polyester outside jacket layer similar to the feel of cotton. Available in white, black or tan. 1.25in diameter: Popular with elementary & grade school children. 1.5in diameter: Most popular among all ages, from high schools to military training. 2in diameter: Larger size proves for a much harder climbing challenge. Remember to always use appropriate mats or material under and around all climbing equipment. All sporting and PE activities carry the risk of injury to the participants. Improperly maintained equipment and inadequately supervised programs are significant contributing factors. All equipment must be thoroughly inspected and maintained to reduce the risk to the users.